Hand'Solo Records » Blog Archive » Grandpa Funnybook 2 mixtape released – CD & digital! Home Bass > Grandpa Funnybook 2 mixtape released – CD & digital! Now available as a FREE download or as a limited CD for only $5, the new mixtape from Grandpa Funnybook and Hand’Solo Records is a nerd-riffic good time. 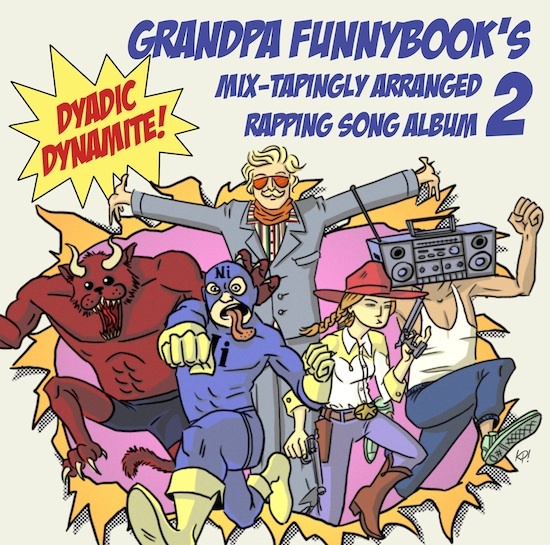 If you like songs about Star Trek, Robotech, zombies, time machines, prison asteroids, comics, cartoons and more geek awesomeness, check Grandpa Funnybook’s Mix-Tapingly Arranged Rapping Song Album 2: Dyadic Dynamite!